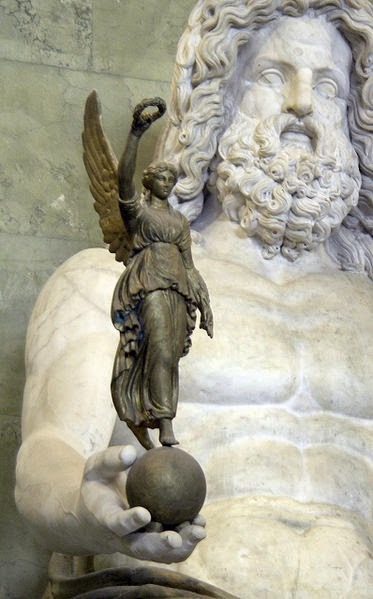 Four victories (winged nikes) were traditionally said to support Jupiter's throne, one on each pedestal, as 'if dancing'. I wonder if the four stars are somehow related to the four victories? Four stars appearing above, attend him, while by the right part a splendour of right reason of the conduct of humanity, in which customs he instructed ignorant men, the first leaders of the state. At the left that light by which he published the inviolable laws and he decreed the society which would be cherished by humankind, being guarded by equality. On the lower right side appears a burning star like Mars, which he lets loose frightfully if scorned, but especially so that the republic may be preserved. How the illustrious example of Jupiter shines for men! Who for the sake of sacred worship happily defeated the blaspheming Giants by war. To the left, a thunderbolt, which at one time he often used to protect his sacred laws against so many lustful and violent men. How do you arrive at ... "four stars attend him (assist or stand by him)" ???? Cause of the 4 cardinal virtues of Borso? I wonder where Marziano got a 'star like mars'? I wonder if he misconstrued Jupiter's Arms-Bearer (Jovi Armiger) with a martial type figure (Instead of with his eagle)? 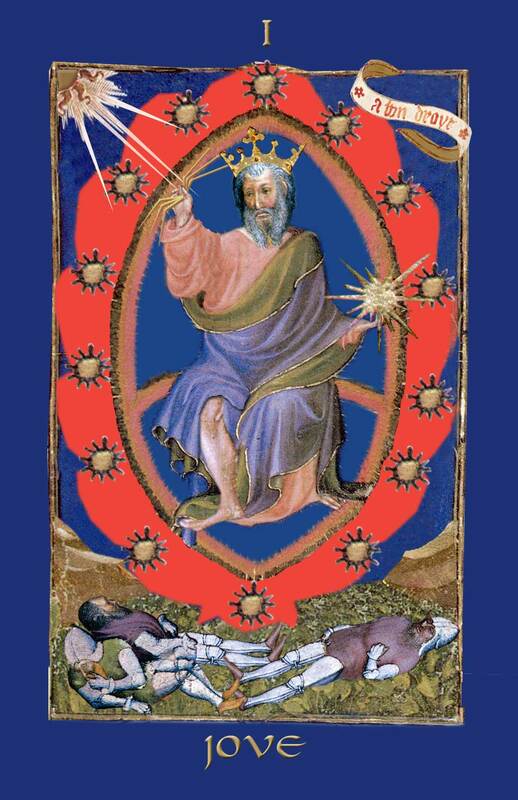 I think still, that the 4 lights are something like Sun-Moon-Star-lightning distributed in the 4 corners as on the Tarot de Marseille-World. Kronos ... 3 male ... the 3 female go to the Okeanos position, which "empty"
Pallas, son of Koios, marries Styx ... that's the connection between this world and the other world. That's the place for the triumphal chariot. And for the ship to the underworld. Huck wrote: I think still, that the 4 lights are something like Sun-Moon-Star-lightning distributed in the 4 corners as on the Tarot de Marseille-World. Lightening yes, but I don't see why Sun-Moon-Star would appear as emblems of Jupiter. Also, if I recall right, elsewhere I think you suggest that Sun-Moon-Star are fairly late additions to the smaller trump number, possibly conflated with or as alternatives to the theological virtues; but here you seem to imply they were inherent in or conflated with a 'trump' in possibly the earliest ancestor to the triumphs - the two views don't seem consistent? 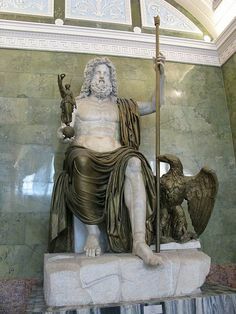 As well as a possible misconstuction of the mars-like star from Jovis Armigter, some representations show beneath the figure of Jupiter a soldier figure in full armour that could be construed as mars-like, but actually meant to represent the giants that Jupiter overthrew. I have been wondering if a comparison of Marziano's description of the Gods and earlier souces has been made, to identify the source of his descriptions. I have tried to start on a comparison myself, starting with Boccaccio's Geneology and Petrarch's Africa (based upon Albricus) - but with limited access to the internet at the moment have not made much headway. Generally there is some reasonable doubt, if the text of Martiano da Tortona is really complete. Decembrio reported 1500 ducats, which were paid for the cards (to Martiano da Tortona). The next high price for playing cards are 40 ducats in Ferrara (1423), that's a huge difference. Very high salaries (nearer to the 1500 ducats of FM Visconti) were paid occasionally for scholar works under pope Niccolo 1447-1455. The operation Michelino deck and its high price would be better understandable, if one assumes, that Martiano da Tortona wrote a big work in the context of the Michelino deck. The Michelino deck used the 12 Olympic gods. The 12 Olympic gods as a scheme became interesting, when Poggio detected the astronomical poem of the Roman astrologer Manilius during the council of Constance in a German library. Manilius used the 12 Olympic gods for his zodiac system. Filippo Maria Visconti was very fond of his astrologers and they were important to him. Likely he thought, that he had the best astrologers of his time. When the Manilius system appeared as a classical work to astrology and his own astrologers even didn't know the work, he should have been quite alarmed. It could have been an urgent interest for him to promote a study about old mythology and its true content. Martiano da Tortona, also called an astrologer, would have been the right man to fulfill the task. 1500 ducats for such a difficult project wouldn't have been too much. Martiano da Tortona was still living in 1423 and was clearly dead in 1425, the precise moment is unknown. I might well be, that Martiano da Tortona died and the work wasn't finished, a lot of material might have been produced, but not sorted. Since recently we have information, that a Venetian scribe was responsible for the Michelino deck text in Paris, likely commissioned by Iacopo Antonio Marcello in some haste in 1449. Marcello didn't send the original, and we don't know, what the original was. ... a man, who lived in the same time as Manilius. Then we have about 10 years later, that Borso in Ferrara started the Schifanoia project, on the base of the Manilius text. Before we already have a growing interest in astrology/astronomy in Ferrara, Pellegrino Prisciani, an astrologer, became a strong man at the Ferrarese court. Later, around 1472, the Manilius text was printed in Ferrara. Regiomontanus soon followed in Nuremberg. The astronomical studies of the time made quick advances, testifying a strong interest in this field of research. Who had the additional material of Martiano of Tortona (if it really existed)? Iacopo Antonio Marcello would be one of the best addresses for this question. And from his hands it might have gone to Ferrara. So, somehow the perception has changed in the last days. For the 4 objects in the corner: Jupiter had an earlier association to the "16", the Jupiter square. Further we have Saturn square, 3x3, which results in 9 fields. Saturn now has something of Father Time and Father Time in the later time got in the Tarot in some versions the number 9. These are two phenomenons, which we can't really explain, as we don't have enough information, how Tarot developed. But it is plausible, that both phenomenons are not just accidently so. Ross translated "4 stars", likely with right, but "4 lights" might be better, cause in the closer description "star" is only used once (3rd object) and for the 4th object we read "thunderbolt" and a thunderbolt isn't a star in our modern understanding and language. So the "4 stars" interpretation runs in a contradiction. But if I chose "4 lights" instead, then "Sun" and "Moon" are possible. On the lower right side appears a burning star like Mars, which he lets loose frightfully if scorned, but especially so that the republic may be preserved. How the illustrious example of Jupiter shines for men! Who for the sake of sacred worship happily defeated the blaspheming Giants by war. To the left, a thunderbolt, which at one time he often used to protect his sacred laws against so many lustful and violent men. When Marziano wants a thunderbolt, he says so. I would think by "burning star" he means a burning star, like Mars in being red, but perhaps also with flames. Anyway, something to indicate that it is hot. 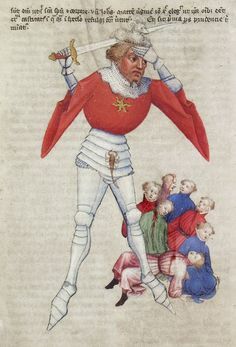 In Ross's earlier reconstruction, the figures beneath, the armoured guys, comes from figures of Jupiter with the Giants he overthrew beneath him, but a soldier might also be thought of/mistaken as martial? Which is the "burning star? I would think the one in his left hand, although it should be red. It is surely not one of the soldiers on the ground, because ti is something he "lets loose when scorned". Marziano says, according Ross, "Four stars appearing above, attend him," and then he reports 4 lights (or forms of lights), for each corner one. Are there now 8 lights or 4 at this card? 4 stars plus the 4 light objects in the 4 corners? Or are the "4 stars" identical to the lights in the corners?